Stepping out on my balcony several evenings ago just before sunset, I first spotted a mallard at the base of our osprey nest. This different looking mallard is seen around here in the spring and summer. After some googling, I further identified it as a Duclair or White-bibbed Mallard (not quite sure if both names is the same one type). It is supposedly a hybrid of a domestic mallard and originated from France. I wasn’t able to identify the difference between a male and female. In fact, I found very little other information, sorry. 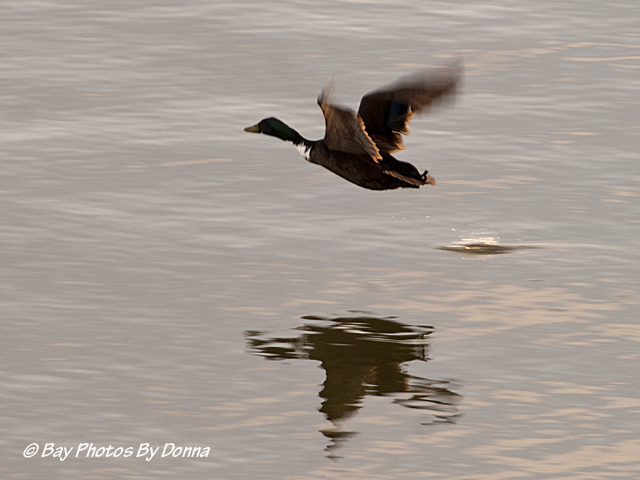 Anyway, the visiting mallard had a brown body, brown wings, white-bibbed neck, and dark green iridescent head. 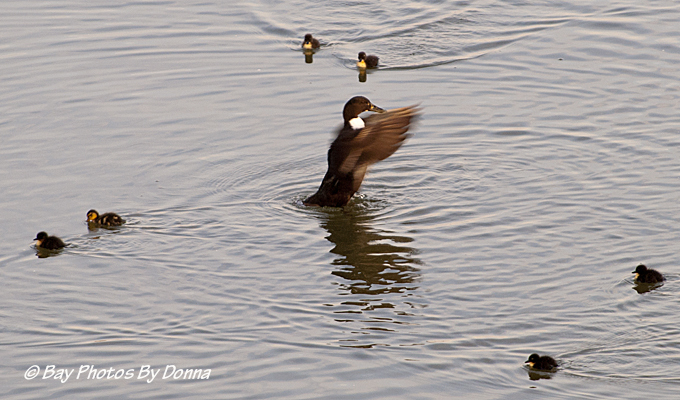 He/she was swimming along the berm and then quickly took flight! After following his/her flight, I quickly looked up to see if a possible eagle was in the sky. But nothing. I scanned the berm again and spotted a female Red-Breasted Merganser entering the low-tide pooled area at the base of the osprey nest. Cool! 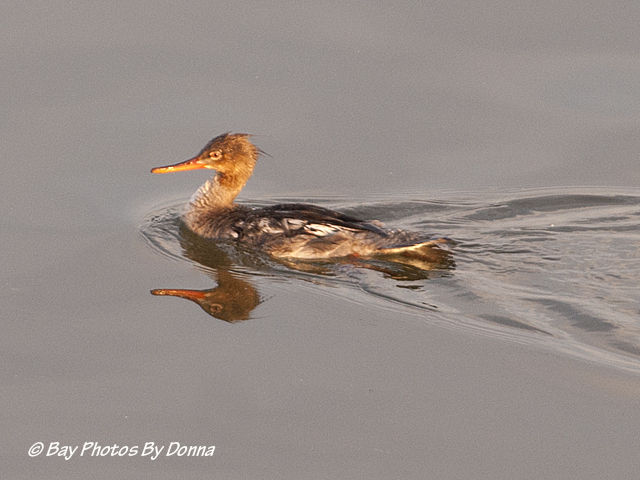 As she swam along, the merganser was skimming the water with her beak just below the surface. After a bit, she would rear up and shake her head! 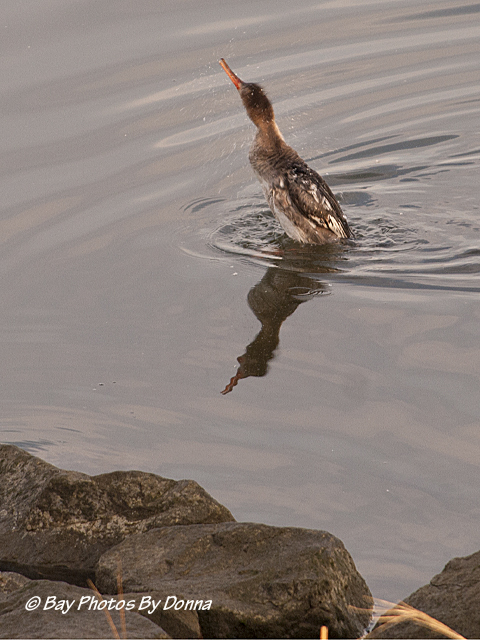 Female Red-Breasted Merganser – Shaking off excess water! She would skim some more and then rear & shake again, continuing along the berm to my left and out of sight. A couple of poses of her with reflections! I retreated inside for a few minutes, and then went back out to the sound of peeping. 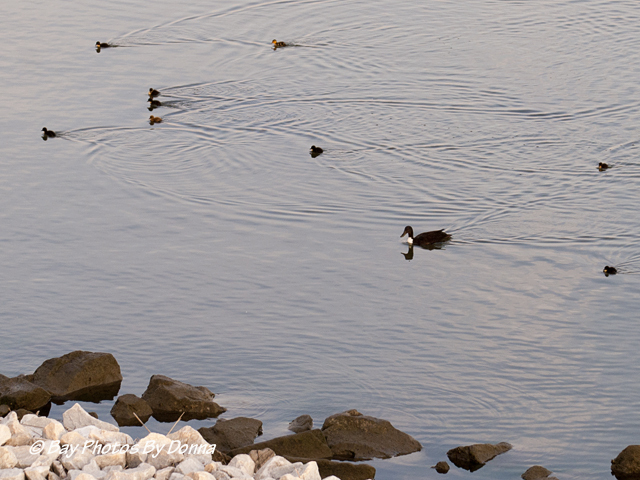 The Duclair Mallard was back, off to my left with a total of nine ducklings. Super cool! I had thought this might have been a male but maybe he’s a she? 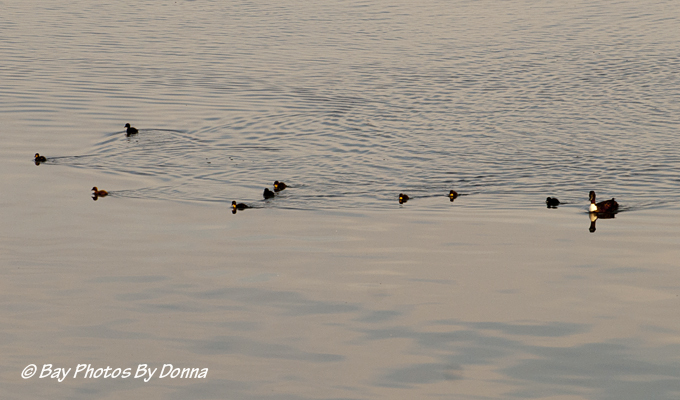 Duclair or White-Bibbed Mallard with with eight of nine ducklings (I missed one in the shot!) The bottom three are practically running on top of the water. Cute! 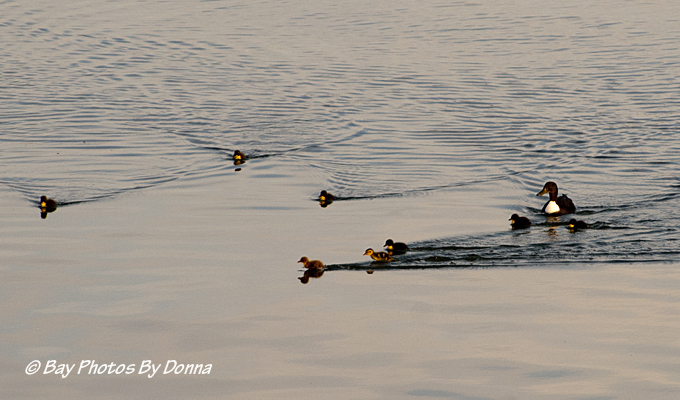 Bravely, the little ducklings were wide-spread, feeding and running around. Some looked identical to the parent, others were light tan. When the parent called out, they’d all come quickly to her, and then they’d take off again. It was quite cute. 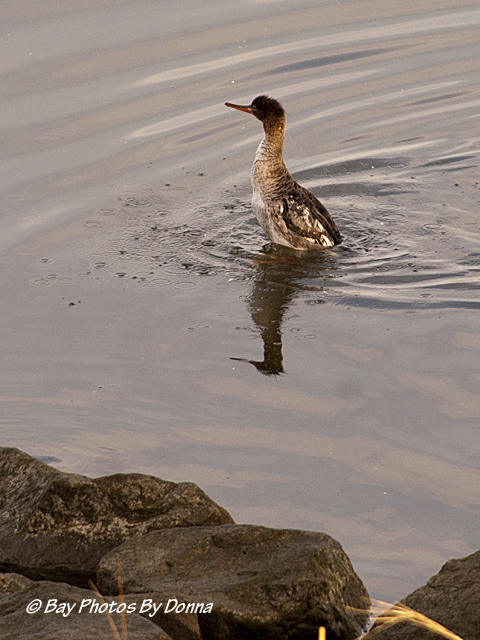 To the left of the scurrying ducklings, coming towards them was the female Red-Breasted Merganser. The ducklings were not fearful of the merganser as she made her way through them and towards & alongside the parent mallard. 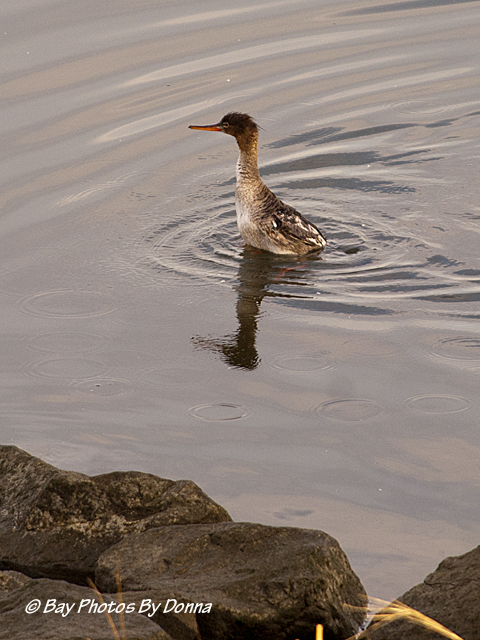 All seemed nice and friendly, and I was shooting, thinking how nice…..until the merganser reared up again and began to shake. 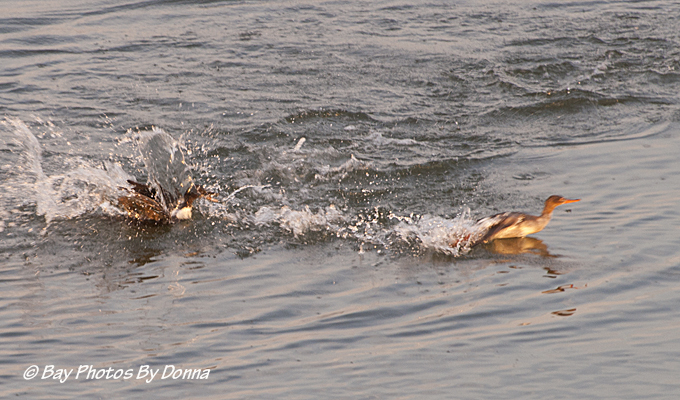 In a split-second flash, the mallard turned and attacked the merganser! 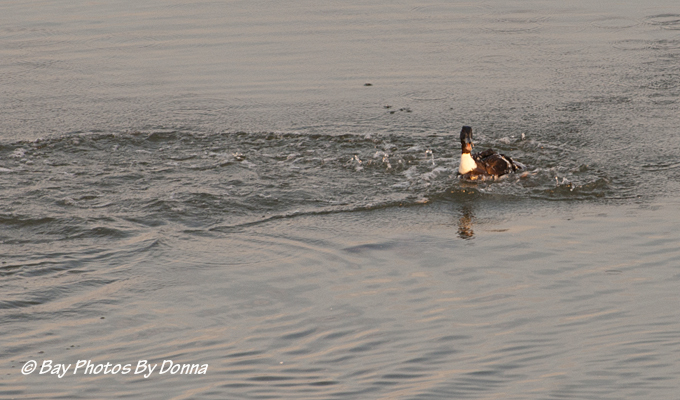 After all the splashing, the mallard surfaced, looking around for the merganser. 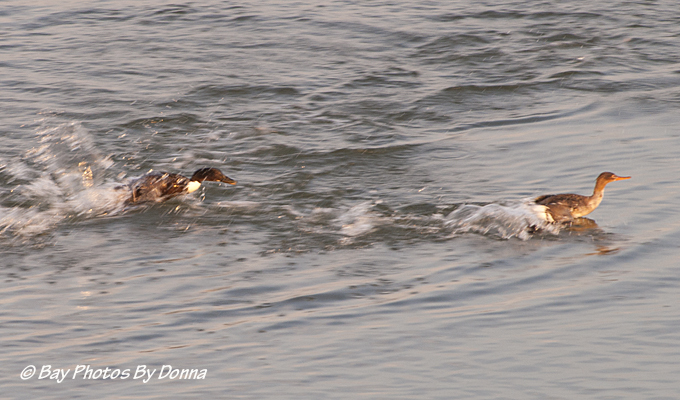 As the merganser surfaced, the mallard spotted her…..
and with fury, flew and pounced again at the merganser who was trying desperately to get away. 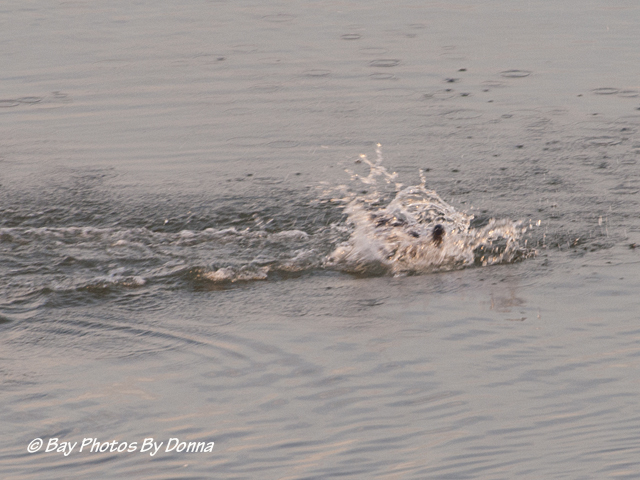 The mallard missed the merganser, who hightailed it out of there! 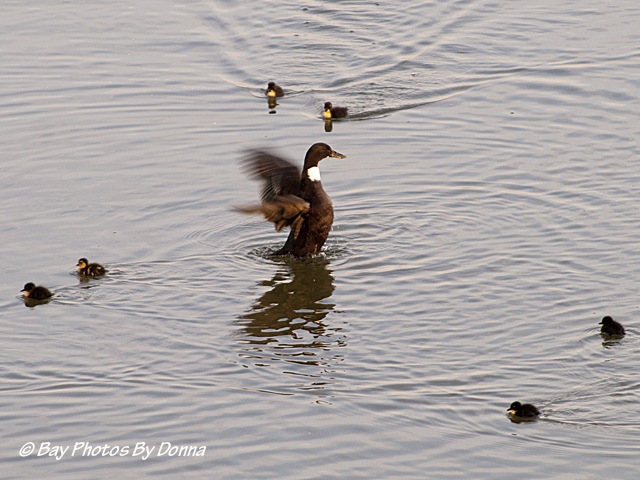 With the merganser out of sight, the mallard called to the ducklings and declared victory! 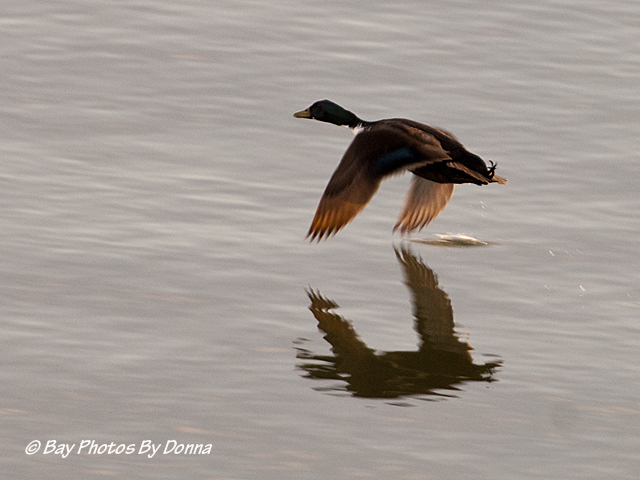 And with that, the mallard took the ducklings off to my left and out of sight! All in 12 minutes of photo-op fun! I hope you enjoyed, and thanks for stopping by! Such amazing pictures. and all their behaviours too. A lot to learn and enjoy here! I could sit all day and watch a bird’s or animal’s behavior. Just seeing their activity to survive is fascinating, but also seeing how they just enjoy life through bonding or flying. Really makes you feel good inside. 🙂 Thanks NatureSnippets! I wrote and illustrated weekly nature articles for several local newspapers for 10 years. I spent so much time alone hiking, camping, sitting in the variety of habitats. It’s so amazing what can be observed, and the bonding that results from spending that quality time in nature. 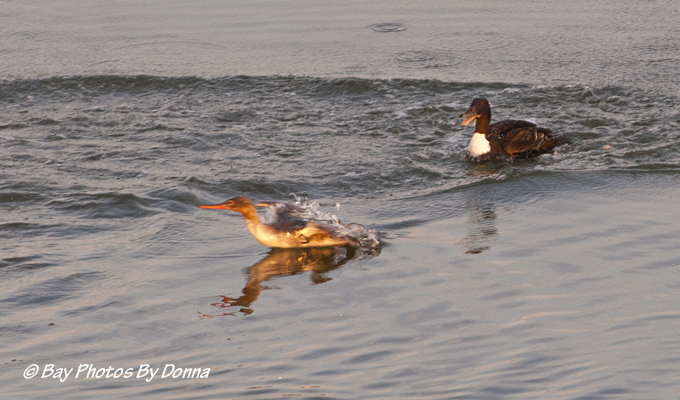 Donna, great job showing this mallard and her family and the Merganser. 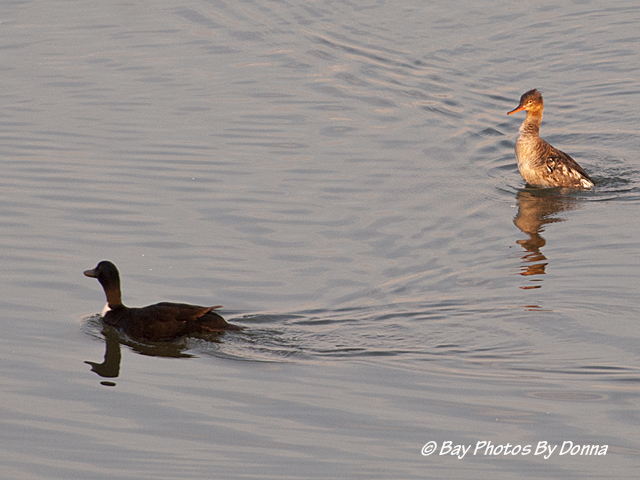 You sure get cool waterfowl to view and photo. Love today’s blog…a big thanks! What drama! Thanks for sharing such interesting photos and the commentary to go along with it! Never know just what to expect from your balcony. The ducklings must have been such fun to watch. Enough to keep you busy all day long! Thanks HJ! Great photos and an interesting bit of drama as well! Enjoyed the photo series and the action-packed story! Thanks for sharing, Donna. Excellent photos of interesting species engaging in some wild antics! What a great sequence. Thanks for sharing it, Donna. Thanks Martha and you’re welcome! Fantastic series of photos Donna! Loved the story told thru the photos :-). This series put a smile on my face. Thanks! You’re welcome, I love watching them and enjoy showing their behavior. Sometimes they can be quite funny! And your smile made me smile, thank you! 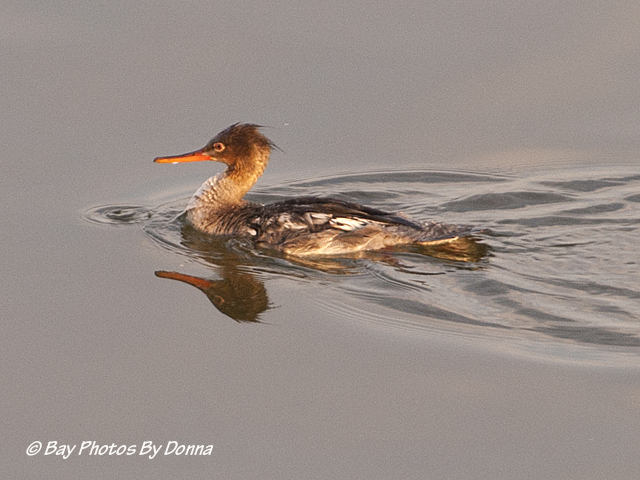 Photos of the Merganser w/reflection are breathtaking! Thanks for sharing! When she made her way around the berm, I was so hoping she’d head to the calm water area, and she did. But she wouldn’t slow down so I was lucky! Thanks Eastern Babe! I think so! So glad I have this way of sharing or I’d bust for sure from all my excitement. 😉 Family can only look at so many photos for so long, lol. I did enjoy this….the photos are great as is the narrative!!! Thanks for sharing Donna!!! Thank you David very much! 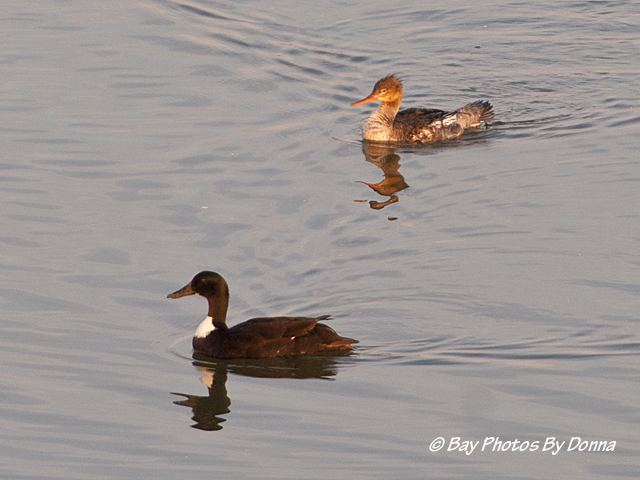 I was surprised by the drama between the merganser and mallard. 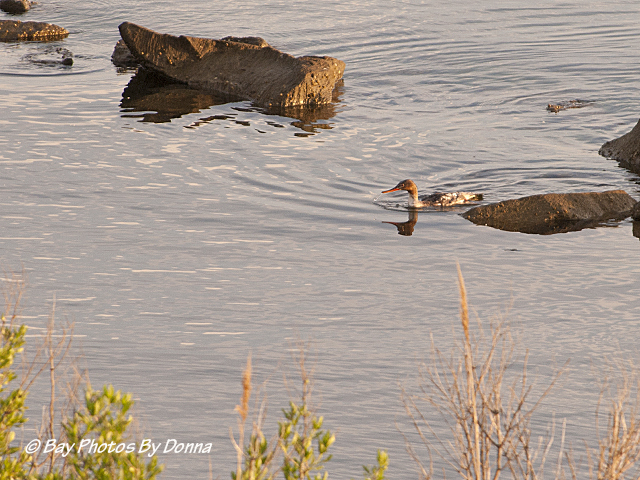 We only see the red-breaster merganser here during migration, but it was neat seeing your photos. They certainly surprised me too! Thanks Deb! Pretty cool beak, huh?!! 🙂 Thanks Margie! As someone else commented, nothing comes between a momma and her babies, and this momma proved it! 🙂 Thanks Tom! i think you have photos of two different ducks. 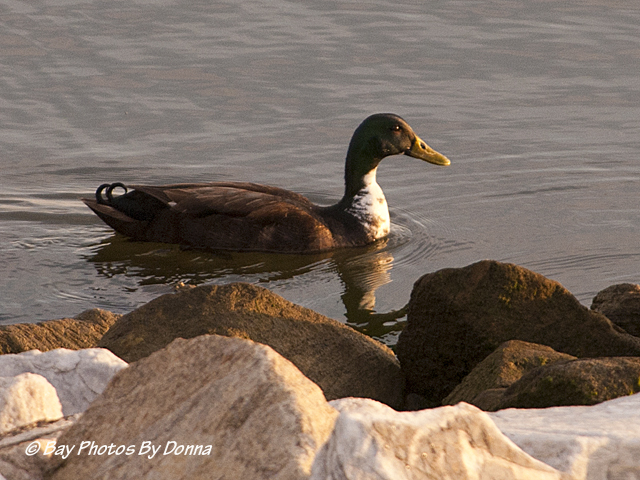 the first mallard type clearly had the male tale curls and the the second duck does not. maybe a pair?